Can air filters be fun? If you have an animated character named Marty the Maintenance Man promoting your products, you can at least make them interesting, educational and, yes, you can also have a little bit of fun. “Marty is an example of trying to stay innovative,” says Leslye Sandberg, president of Permatron. Since its founding, the company has developed new markets and growth opportunities to expand its product lines in a multitude of industries. It has also developed a well-earned reputation for responding quickly to customer orders – whether it’s a custom-designed filter for a cooling tower or a rush order from an OEM. With Just in Time manufacturing capabilities and an experienced staff, this is a niche that Permatron has been able to capitalize upon. Permatron pioneered the use of washable electrostatic filters. The original Permatron filters were used in high dirt load applications such as food processing plants and paper mills. “They were basically designed to be a really efficient least-cost-over-useful-life solution over throwing out filters every 15 minutes,” Sandberg says. Since then, Permatron has developed a number of patented features in its product line, including the PreVent® cut to fit wraparound air filter for outdoor condensing units, enabling home or building owners to save money on utility bills between seasonal tune-ups. Permatron works with customers in the design and manufacture of air filter components to their precise specifications so they can be integrated and performance-matched for any application. Such applications include electronics, food service refrigeration, transportation, beverage dispenser, telecommunications, medical and industrial equipment. Custom filtration includes varying the densities, number of layers and types of media depending on the air flow restrictions and the desired filtering efficiency. Permatron moved to its current location in Elk Grove Village, IL, two years ago, a result of the company’s continued expansion. Permatron’s first customers were factories, which were sold through specifying reps and available locally in the Chicago area to homeowners. As residential indoor air quality became an issue for homeowners in the 1980s, Permatron seized upon an opportunity to market their products nationally through wholesale distribution. “We had the products for this market, but as a smaller, locally based company, we had to ask ourselves how could we best utilize this opportunity. And the answer was, of course, through distribution,” Sandberg says. As the demand for its filters increased, there was also a tremendous amount of competition, Sandberg recalls. But most companies were gone within 15 years due to distribution, quality or pricing issues – a low price alone doesn’t mean success. While Permatron had a longer history, quality products and a successful distribution strategy in place, they also had the capabilities to do more for a wider base of customers. “Permatron has always had machining capabilities,” Sandberg says. This capability had begun when Permatron developed its OEM business, which, she says “became a large and very nice base from which to survive the kinds of changes that went through the washable air filter market on the residential side.” She estimates that about 65 percent of Permatron’s business is for OEMs. Among the products that are most in demand by Permatron’s wholesale distributor customers are its washable metal mesh filters for the commercial and light commercial markets. Wholesale distributors will often have their mechanical contractor customers work directly with Permatron to solve their air filtration problems. Permatron built its manufacturing organization on its ability to turn around custom products in any quantity with very short lead times. Permatron developed this process as it grew its relationships with the OEMs, and this has since developed into how it goes to market for its distributor customers, too. Because of Permatron’s ability to custom build filters for a specific project, the wholesale distributor can have the product in a customer’s hands within 48 hours, Sandberg says. Solving a customer’s problem quickly and efficiently with a quality product is good for the customer and provides a solid margin for the distributor. “We’ve positioned ourselves to our distributor customers as having the shortest lead time in the industry with a focus on quality and cost effectiveness,” she says. Preventive maintenance and the associated savings are hot button issues with commercial and industrial building owners, she says. “Proper air filtration and air handling means saving money through the operations of the equipment, electric bills, energy bills and maintenance,” Sandberg says. Permatron recently expanded its line of PreVent filters and hail guard netting, which they designed around preventive maintenance. 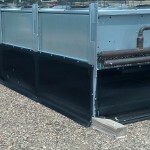 Because Permatron can customize its filters, you can find them on rooftop units and two-story cooling towers as well as on mining equipment and industrial compressors. Often, they are one-off solutions that are application driven. Doing business this way creates “a small amount of chaos,” Sandberg admits. Its factory is ISO process-oriented, which she says is a phenomenal tool for manufacturing from the time of order placement all the way through to final shipment. Permatron configured its factory for flexibility for the unskilled and more skilled work that is required. Plant Manager Hector Villalobos runs a daily report of the orders coming in so he can have resources to complete each job. Sandberg cites a team of very experienced leaders who she can count on in any situation. While other manufacturers may not have the capabilities for specialized work, Permatron embraces the challenge of those difficult orders. Sandberg says it’s about making the most of every opportunity. Such work has not gone unrecognized. The Alliance for Illinois Manufacturing awarded Permatron its Manufacturer of the Year Award, and Sandberg was inducted into the Chicago Area Entrepreneurship Hall of Fame. She is also the president-elect of the National Air Filtration Association. Frank DiStefano, Permatron’s operations manager, says Sandberg purchased the company years ago from her father, Roy R. Sandberg, and grew the organization to a new level of success. The company culture is one that encourages learning, growth and talent development, he adds. And that brings us back to Marty the Maintenance Man. For a company that embraces new opportunities, marketing has been an area of growth. Gayle Matthies, vice president of communications, saw the opportunity to market the company online and developed Permatron’s online presence, which ranks high in search engine results. As a result, Permatron gets orders from customers around the world who know what they want and are ready to buy. “They see what’s on the site and they say, ‘I want this and this plus this.’ They’ve figured it all out by the time they send the email,” Sandberg says. The concept for Marty the Maintenance Man came from the idea to improve the Web experience of customers and potential customers. After all, if your website is a gateway, why not make the content on that gateway compelling and interesting? Permatron worked with a video artist in the United Kingdom on the concept, and it proved to be so successful that they used Marty in the online video game. “Our whole goal was, in a less-than-boring way, to communicate the concept that you can protect your equipment,” Sandberg says. Michael Maynard is a contributing editor based in Providence, RI. He writes frequently on HVACR, construction and architecture issues. Contact him at michael.maynard@lycos.com. At Permatron, all work flow operates around a just-in-time mindset with 100 percent on time shipments the daily goal. All order entry takes place within a certain time frame. Each morning, the plant manager reviews the day’s shipping manifest and work in progress with group leaders. The plant manager also looks several days out so that he can bring in temporary labor to boost production on a day-to-day basis with experienced group leaders managing newcomers. The QC and shipping departments operate off the daily expected ship report, so they are looking for all orders expected to ship and will go looking for them as the afternoon approaches. The entire factory gets to go home 15 minutes early any day that all products pass QC and all orders make it out the door on time. If one order is missing, everyone stays. So it’s a great team building approach that has everyone working together every single day. This mindset began with our OEM customers many years ago. On time delivery of a quality product is critical to any OEM. If the product doesn’t show up or pass quality specs, their production line shuts down. The last thing you want to be responsible for is shutting your customer down. So we did everything in our power to operate with streamlined and check pointed manufacturing (who knew we were doing continuous process improvement and lean manufacturing by accident?). We have developed some of our most successful market niches and customer relationships by approaching every transaction with equal dedication to quality and delivery. Our success in distribution channels I also attribute to the JIT mindset. Every order to every distributor is handled just like our OEM orders, large or small. We have the fastest turnaround in the industry, shipping custom filters in about 48 hours. We have a “no problem” attitude when a distributor calls looking for an obsolete or obscure filter need since we build custom products every day. I think it is vital to the well-being of a company to pursue your core competency. Get together the right group of people – at Permatron, that’s a group of people who want to meet needs or solve problems for customers with a minimum of fuss – and you have a formula for creative and effective solutions. Contact: Leslye Sandberg, president or Gayle Matthies, vice president, Communications, 800/882-8012 or visit www.permatron.com.